Earlier this week, I wrote about Destiny 2's stingy resource economies and how they've been throttling the game's new (and largely excellent) Forsaken expansion. Masterwork cores and mod components are so scarce that players are reluctant to spend any on their favorite gear, and Forsaken exotics are so hard to find that chasing them doesn't feel worthwhile. Happily, Bungie addressed these problems and a few others in its latest This Week At Bungie blog post, which promises more plentiful cores and more exciting exotics. Masterwork cores are first on the docket. Bungie acknowledged that "there are not enough reliable sources to earn masterwork cores, which can make deciding what to spend them on too difficult." To fix this, Bungie plans to "create more reliable and plentiful core sources," which could be anything from new bounties to buffed masterwork dismantle rates. Additionally, to make the idea of using masterwork cores to infuse items less confusing, the cores are going to be renamed "so their purpose is more obvious." This makes me wonder if Bungie will rehash the ascendant shards from the original Destiny. Meanwhile, exotic drops are being tweaked so players receive fewer duplicate exotics, which has been a serious problem. Exotics can be rare, but they shouldn't be rare and disappointing. As Bungie put it, "there's nothing exciting or powerful about getting your fourth Fighting Lion when all you really want is a Two-Tailed Fox." Bungie didn't promise total duplicate protection, but they did say a coming update will "increase the chance for exotics to drop something you don't already have," which is a good start. Here's hoping it's a sizeable increase. Sadly, Bungie didn't say anything about mods or mod components, which if anything are even rarer than masterwork cores, but they did touch on another underwhelming part of Forsaken: Iron Banner. The first Iron Banner of the expansion concluded last week, and it was a bit of a letdown. It came with seven weekly bounties but only two awarded powerful gear, and the gear we did get wasn't all that exciting, so many players abandoned the Iron Banner playlist after a few days. To make the next event more rewarding and appealing, Bungie's changing several Iron Banner bounties to make them easier to complete. The bounty for generating 100 orbs in Iron Banner is being reduced to 50 orbs, for example, and the bounty for 30 match completions is being toned down to 15. On top of that, when the next Iron Banner arrives, all of the weekly bounties that come with it will reward powerful gear. This will not only more than triple the event's power potential, it will also make the bounties themselves more compelling. Quite frankly, these changes can't come soon enough. 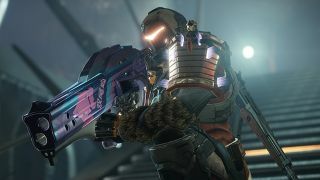 Giving players more masterwork cores will free them up to experiment with more gear, and ensuring fewer repeat exotics will make both high-level content and everyday milestones more exciting. I reckon the modding economy will still need to be addressed at some point, but these changes are a strong start to refining Forsaken's already stellar experience. Destiny 2: Forsaken is clearly not without its problems, but it's still a great expansion. Read our full review to find out why.